ABOUT US: We are Blissful Bathrooms Ltd registered in England 9090467. VAT No. 869 4656 60. Registered office: 3 The Green, Station Road, Woodmancote, Cheltenham GL52 9HR. Tel. 01242 678080. Directors Wayne Stew & Krystyna Ralph. We have tried to keep our Terms & Conditions as simple as possible. We rely on trusting relationships with our customers and have established an enviable reputation with 5 star testimonials in nearly 10 years trading. 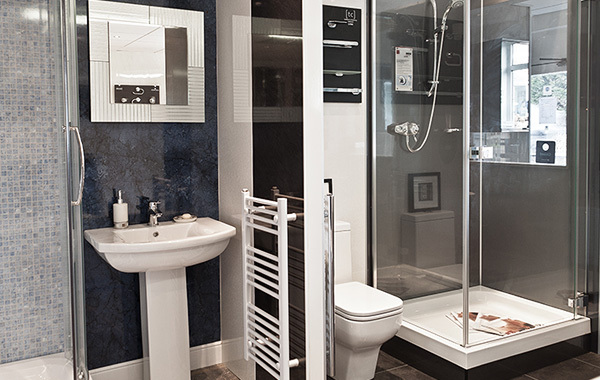 Our aim is to provide a perfect experience creating your new bathroom. QUOTATIONS: of goods and labour provided by the company are valid for 3 months. Prices and timescales are not binding on the company although we will make every effort to achieve what we promise. The order is binding once the customer returns signed copy and pays deposit. RIGHT to SUB-CONTRACT: The company shall be entitled to sub-contract all or any part of the work. In practice we enjoy longstanding relationships with all our sub-contractors who are chosen very carefully. PAYMENTS: All prices include VAT at the prevailing rate in British pounds. We ask 10% Deposit on order; 80% within 3 days of commencing installation; with the balance paid after completing satisfactory installation and within 7 days of final invoice. Invoices outstanding over 30 days are deemed overdue and we reserve the right to charge daily interest at 5% over Bank of England base rate on the outstanding balance. CANCELLATION: In general orders are not cancellable by the customer but may be possible in writing or Email provided that any costs, expenses or sub-contractor charges already incurred are reimbursed to the company. We retain the right to utilise deposits paid to cover these costs. Any balance in excess will be returned to the customer. RETURN OF GOODS: Goods returned due to a change of mind may be subject to a handling charge of up to a maximum of 20% for standard items and up to 30% for special order goods. This charge is made by the suppliers so we unfortunately have no option other than to pass it on. Please ask if in any doubt before ordering goods and we can advise accordingly. SUPPLY ONLY: The company will take all reasonable steps to ensure protection from loss, damage or destruction of the goods supplied to the customer who assume responsibility after safe delivery and will own title to the goods after cleared payment in full. Faulty or damaged goods on a supply only basis can only be returned unused in the original packaging within 7 days from the date of delivery under advice to the company. We will exchange the product or provide a full refund together with any applicable delivery charges and any reasonable costs you incur in returning the item to us. We reserve the right to inspect all returned products prior to agreeing to any part-refund, full refund or product exchange. WARRANTY: The company will provide a 12 month guarantee to cover workmanship and installation defects. This is in addition to manufacturers warranty on the goods. In the event of accidental damage or faulty goods reported during installation the company will arrange repair or replacement. PRODUCT LIABILITY: We cannot except any liability for products not originally installed by the company which may require alteration, modification or re-installing at the customers request. CUSTOMER OBLIGATIONS: The customer shall cooperate with the company by arranging access at dates/times agreed and by supplying such information reasonably requested. The customer will also obtain any necessary permissions, licences and consents. BLISSFUL BATHROOMS Ltd OBLIGATIONS: The company will manage and perform the installation with reasonable skill and care and accepts responsibility for the standard of workmanship and condition of tools and equipment. We are fully insured. GOVERNING LAW & JURISDICTION: These Terms and Conditions shall be governed by and construed exclusively in accordance with the law of England. DATA PROTECTION: We respect your privacy and comply with the Data Protection Act 1998. We will not disclose or pass personal details of customers to any third party.